Here's my self-administered quiz on all things male. Part dandy, part free-spirit, part mystery. So Zorro fits the bill. So does Robin Hood. Any others? Cartoon characters maybe? Ah, yes. Mendoza from the Mysterious Cities of Gold. I fell for the well-heeled Catalan with his elegant rapier. I blame it on those sideburns. It's the caped navigator thing. I also had a fling with Ulysses. But he was too modern... I needed 16th century. Hmm...what male figures do you enjoy watching today? Very few. I'm not into symmetry. The cleancut Meditteranean jetsetter in his Armani suit just doesn't do it for me. Neither do the likes of Brad Pitt, Bruce Willis, Tom Cruise, Heath Ledger, Jude Law, Matt Damon, Keanu Reeves (heavens forbid) and all those overdone, over-preened Hollywood icons. Not into bulging biceps either, so Arnie and Stallone are also out. The male cast of Friends is a no go. What were those girls my age thinking? I mean, they're just kids for heaven's sake. Who would be in your top ten for male visual pleasure? 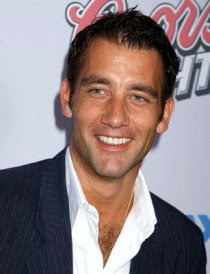 Clive Owen - smouldering, raw energy. He is fabulous in "Closer". Rufus Sewell - loved his character in Amazing Grace. 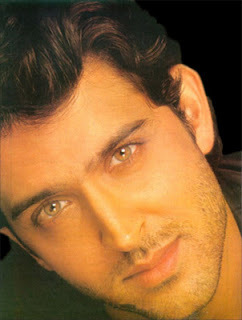 Great eyes. 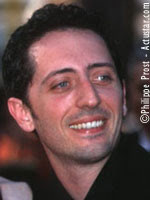 Gad Elmaleh (left) - you just have to watch this guy in "Priceless", he stole my heart. Benicio del Toro - intense everywhere he goes. Jean Reno - when he was a little younger. Love his voice. What does Jason think about your crushes? heh heh. Depends, Male or female? No seriously, we're both secure enough to deal with this. Easy: Nicolas Cage in City of Angels. This would have to be one of my favourite characters. Soulful. Also on the list: Djimon Hounsou in Amistad, Nicolas Cage in Conair, Nicolas Cage in Face Off (hmm...seeing a pattern there? ), Clive Owen in Closer, Leonardo di Caprio in The Departed (sigh), Edward Norton in the Illusionist (spiritual, enigmatic, intelligent) and a few others that don't spring to mind. Characters are always more interesting than the actors themselves wouldn't you say? Tom Cruise. Always so angry no matter what role he undertakes. Not a Johnny Depp fan? Johnny Depp is a kind of muse for me. He's beautiful, inspirational and very talented but I'm not into him. I like him like a dad. He's great, especially in Face Off. Big Brother 6 question: Jamie or Dino? Big Brother 7 question: Billie or Zoran? Zoran. But I prefer Daniela. She had more balls. Nice! Please do more hot men entries, like daniel henney, thomas tevana, and tom welling! Please? !